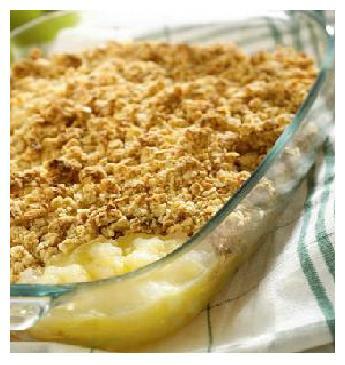 Make the following irresistible Apple Crisp Recipe for a warm, satisfying dessert. Most sweet treats are okay in small amounts. Especially if you add less sugar. Take small servings. Eat intuitively. Lose the guilt. You can also vary these recipes by using cinnamon instead of pumpkin pie spice, or by using fresh cherries or blueberries instead of apples. Most importantly, use your imagination to make this Apple Crisp Recipe your own. Use butter, oil or shortening to grease bottom and sides of a glass baking pan. Spread the sliced apples in the pan. In medium bowl, stir remaining ingredients together until well mixed. Bake for about 30 minutes or until topping is golden brown and apples are tender when pierced with a fork. SUGGESTION: Serve warm with ice cream. Peel one narrow strip from around the top edge of each apple. Place the apples in a deep baking dish. Fill the centers with raisins. Combine flour, sugar and cinnamon in a medium bowl. Blend in softened butter with a fork. Pour water and orange juice over apples. Bake, uncovered, for about an hour, basting occasionally. Remove from the oven and let cool for five minutes. 1)	Sift dry ingredients together twice. 3)	Sprinkle in oil, then milk, one tablespoon at a time, mixing well after each tablespoon with a pastry fork. 4)	Combine to form a ball of dough and divide it to make a top and bottom crust. 5)	Line a pastry pan with bottom crust. 1)	Preheat oven to 375 degrees F.
3)	Peel and chop apples into pieces. 4)	Splash apple pieces with orange juice and mix to prevent discoloration while chopping. 5)	Combine dry mixture with apples as place onto bottom crust in pastry pan. Pack in firmly. 7)	Cover with top crust, seal edges by pinching them, and make holes on top for steam to escape. 8)	Brush top crust with egg white. 9)	Bake at 375 degrees for 1 hour, or until crust is lightly browned. If crust browns too early, cover pie with foil for the remainder of cooking time. Premium Factory Outlets and Wholesale Goods in All 50 States.